Love in a flower pot for Purple Onion Designs! Hi, it’s time to get all Valentinesy! So I’m here with a card for Purple Onion Designs, and once again it’s clean & simple… but would you believe that I actually used 4 different stamp sets to make this card, CAS can be deceiving sometimes. You can find the links to the products that I’ve used listed below otherwise head on over to Purple Onion Designs and take a peek yourself. Other Supplies: Tack n Peel. Copics – RV10. R20,81. W0. Craft Concepts Woodgrain Embossing Folder. < Previous It’s a Mama Elephant baby shower (video)! Next > Welcome Baby for Scrapbook Boutique (video)! So, so, so darling. I just love this. Thanks for sharing. This is gorgeous! Yet another card I am kicking myself for not thinking of first, LOL! 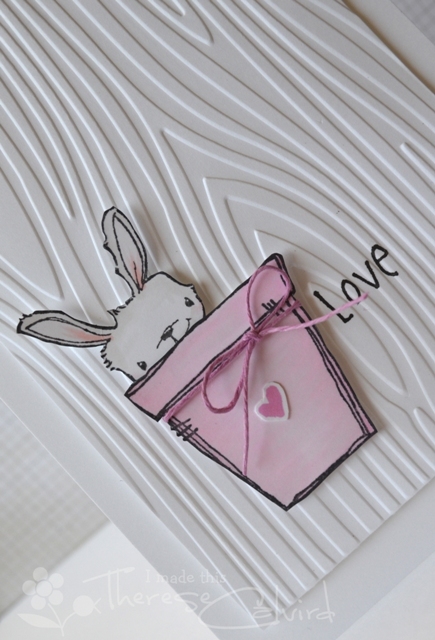 This would make a sweet baby card too… How adorable is that bunny!!! Gorgeous. This bunny is so cute and useful. TFS. So cute cute cute Therese. You like bunnies like I like bunnies! Such a cute card! This is just too CUTE, Therese! 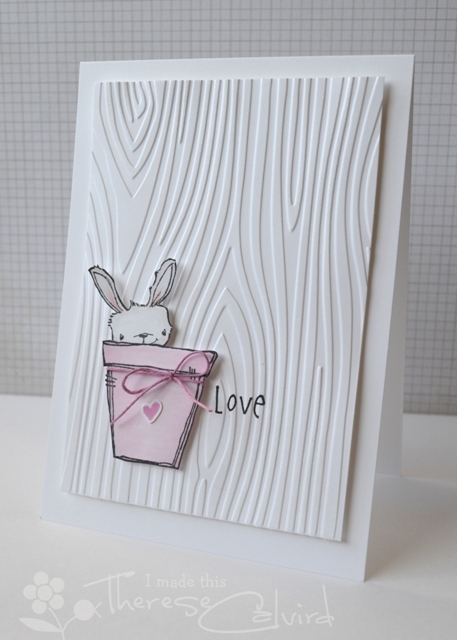 I love the simplicity of your design and the woodgrain background is such a fabulous idea! Utterly adorable! And yes, seriously – when I type out supplies for my CAS-er cards, I’m always stunned by how MUCH is there!